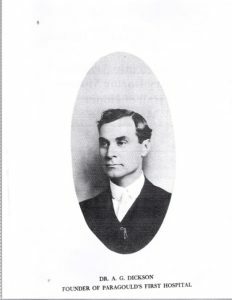 Aaron Graham Dickson was born in Greenboro, Arkansas (Craighead County) on July 26, 1867. His father, James A. Dickson married Mary Elizabeth Gambill in the northeast section of the state, though both of their families came across the Mississippi River from Tennessee. The couple had three children, Aaron Graham, their first born, and two daughters, Nancy and Aletha. James realized the railroad crossing was bringing business to Paragould (Greene County) so he moved his general store to the thriving town when Aaron Graham was about four years of age. The children attended the Paragould Public Schools. Graham continued his education at a Normal School in Lebanon, Ohio, read medicine with a well known, respected local doctor and subsequently enrolled in medical school. He graduated from Vanderbilt University with a M.D. in 1889 at the age of 22. He immediately wanted to learn more, so took graduate courses in New Orleans, then went to Berlin, London and Vienna for additional graduate work and to observe the function of hospitals. With him he took his new bride (married in 1890), Sarah Melissa Boyd a nurse from Chapel Hill, Tennessee. (The couple had no children.) He returned to Paragould and set up an office on 112 North Pruitt Street. Within five years he added a drug store—and dreamed of building a hospital. In 1905, with the financial help of his sister, he built his first “Paragould Sanitorium”, a small nine room frame structure. Then just two years later (1907) Dr. Dickson built a modern three-story well equipped hospital, the operating room especially well furnished meeting the medical standards of the time. On the top floor was a school of nursing. Mrs. Dickson was the matron. Dr. Dickson asked a fellow student from Medical School, Dr. Henry Dickson (no relation) to join him. He did. Soon other doctors came, Dr. Wetherington (under whom he had read medicine before attending Medical School), Dr. Sims, Dr. Hume, Dr. Allen (not a total list of doctors in Greene County). To help with expenses in 1907 he published a “Souvenir Catalogue” inviting other businesses to advertise in it. The book which was distributed throughout the area had pictures of the hospital and its many modern rooms: the library, the dining hall, multi-patient rooms, private rooms, and a bathroom. Each of the two churches had furnished a patient’s room and these were proudly shown. Because the surgery had the latest in surgical equipment, Dr. Dickson’s specialty, a picture of it was highlighted. Another photograph of eight nurses (some assumed to be students) seated on the outside steps with Dr. Dickson added to the advertisement value. The community was proud of its new hospital. Dr. Dickson was offering the latest and best medical care available in North Arkansas.